One of the most important aspects of good taste is knowing when not to do something. You could call it Restraint. You are exercising restraint when you don't buy a fuel-gobbling SUV or when you don't build a 15,000-square-foot house on a one-acre lot for your family of three. If this virtue could be passed along quietly among us there would be far fewer ugly buildings and we would live in a more sustainable environment. On a more advanced level, people of taste sometimes become vocal in chiding those given to Excess. They may even tastefully demonstrate when tasteless governments propose ugly, unnecessary projects in the name of Progress. It has recently come to my attention that the government of Ireland, a place where one expects a certain amount of restraint to come naturally, or at least to be an ingredient in the Guinness, is planning a major superhighway through one of the most beautiful and historically significant parts of that tastefully un-overdeveloped country. 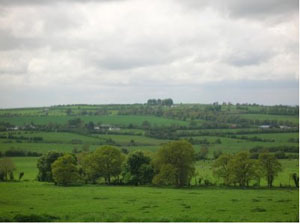 I can't imagine why the M3 motorway needs to run through the Tara Skyrne Valley, the traditional seat of Irish Kings and the Druidic tradition, unless the idea is to destroy every reminder of the glorious pre-Roman, pre-Christian culture that thrived here before the invaders arrived. As one with the blood of the High Kings Brian Boru and Niall of the Nine Hostages running through my veins, I call on all persons of taste and restraint to spread the word globally that a great and terrible sacrilege is planned in the greedy interests of so-called progress and development. Here's a link where you can find out more about this travesty. In the meantime I am trying to determine if, in fact, I am the King of Ireland. I may have to step in. Here's a view of the Hill of Tara.